During our trip this year, I decided to spend the first couple days giving Will my undivided attention before making my first trip to the library. After that, it was a book a day, which is my ideal way of spending time on the beach, at the condo, in the car, shopping, etc. We had a lot of rain, so I had a ton of time to get some quality reading time in. It must have been a lonely rest of the trip for Will, but he promises he didn’t mind. I read a couple great books and have given my brief opinions on each below. Out of them all, I think my favourite was Jodi Picoult’s book because it offered the best story of the three. I read My Sister’s Keeper previously, and will look for more of her books when I am back home. Men and Dogs by Kate Crouch | This book was actually one Will picked out for me on a whim. After reading it that same day, I went back to the library in hopes that they would have another one by the same author. It had a great story line that kept me interested throughout the whole book and had an interesting development of the main characters. I wouldn’t say it was unpredictable, but it was a story I was happy to read nonetheless. I would like to read more from Kate and will probably look for her books when I get home. The Pact by Jodi Picoult | This was my favourite book of all three, and was the most captivating. It was like a chick flick met The Good Wife, and the result was fantastic. Without giving too much away, I can just say that it was one that kept me engaged until the very end and was touching and unexpected all at the same time. 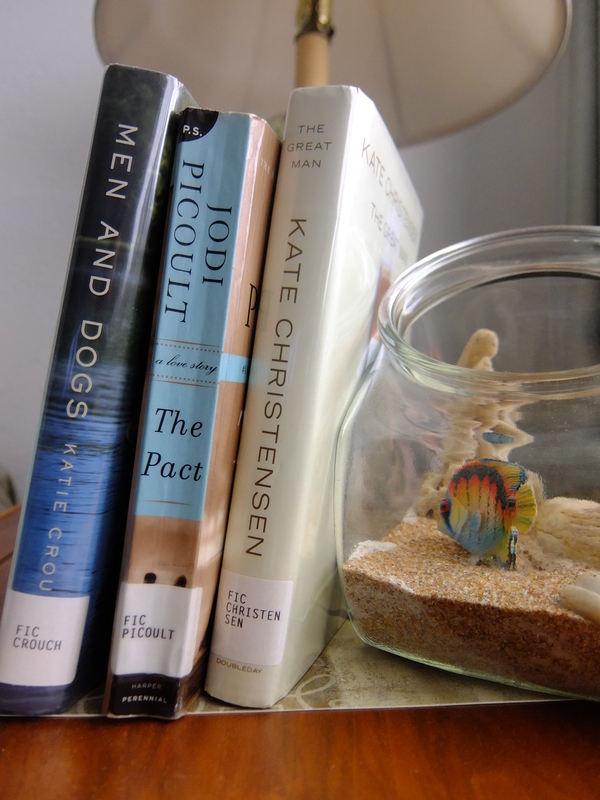 The Great Man by Kate Christensen | Of all three books, this one was my least favourite. I got through it, but the storyline wasn’t really much of anything. It was 300 pages of superficial-ness that showed the lives of three women connected by one man, but didn’t get into the nitty gritty character development I was hoping for. There really wasn’t much to the book and as a result, not much to the ending either. I did pick up another book but was hesitant to start it and not be able to finish it before it was time to head home. I am definitely going to look into getting a library card once we’re settled into the new house, as I will need something to take up my time on the train (more on this to come…), so expect more “book reports” like this, and feel free to make any reading suggestions in the comments below.